We all get 24 precious hours each day. A full 168 hours a week. So why does there never seem to be enough time? Granted, work and sleep can eat up half our daily allotment. Throw in time spent commuting, preparing meals, running errands, and racing through household chores and I don’t even want to do the math. Who has enough time to chase their passions or enjoy their family? There are days when I make great choices with my daily dose of free time: taking brisk walks in the sunshine, reading Harry Potter with the kids, or lingering around the dinner table long after the food is gone, just to enjoy the company. Other days I sleep too late, whittle away time on Facebook, or get sucked into HGTV House Hunter marathons. Then there are those grayscale activities. Is it actually productive to spend an hour loading amazing fonts onto my new computer? Listening to TED talks? Watching WordPress tutorials on YouTube? Or – dare I ask – writing this blog? It’s a constant struggle, determining which activities are worth the time and which are an utter waste. I guess if you care enough to ask the question, you haven’t crossed the line from relaxation to total slothfulness just yet. I’d love to “literally astound” myself. I want to take advantage of every moment I’m given, to be an astounding mother, wife, writer, and employee. I want to be astonishingly well-read, politically well-informed, and spiritually well-grounded. But by the time the kids are in bed, I usually choose to collapse on the couch with reruns of Law & Order instead. Go figure. 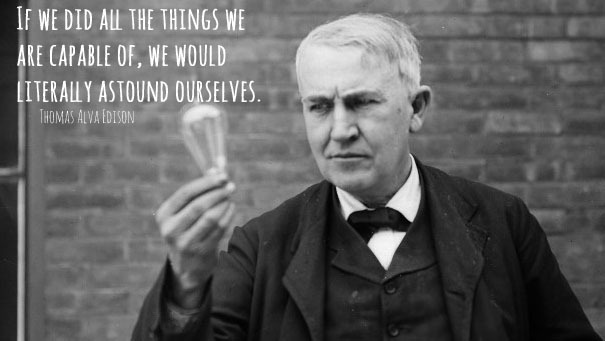 Edison may not have been the nicest scientist in the sandbox, but he did advocate strongly for common sense and hard work. That’s refreshing for a guy with a borderline genius IQ. And something about this quote of his really resonates with me. It sits in the back of my mind as I go through my day, making choices about how to spend my time. It inspires me to be better. To be astounding. So up I go on this snowy Sunday, sorting through my want-to and must-do lists, unable to finish them both but striving to strike a good balance.